Your local Fall River auto parts store wants to make sure that you have everything you need in your car emergency kit, just in case you need it. Even if you belong to an auto club and have great insurance, there are just some things that you should always have in your vehicle, especially if you are taking a long trip or are traveling in any type of serious weather. Before you leave on your trip, stop by LaCava Auto Parts & Supply and take advantage of our free battery testing in Fall River. The last thing you want is to get halfway to your destination only to have your battery give out after you stop for gas or to take a break from driving. One of the best car safety tips that you can get is to have a properly stocked emergency kit in your vehicle. You can get many of these supplies at your local car parts and accessories store. It pays to be prepared for any journey, whether you are making a regular commute to work or going on vacation. Unfortunately, the majority of vehicle breakdowns don’t typically happen where there is a convenient gas station or even great cell phone reception. You need to be prepared for any eventuality and that’s where LaCava Auto Parts comes in handy. Take a look at the following checklist of items that you can get at your local car parts and auto store. Even if you have a brand new vehicle or one that is in great shape, breakdowns and accidents can happen anytime, anywhere and to anyone. A car emergency kit from your auto parts store is designed to help keep you safe until help can arrive. While you can purchase a pre-packaged “emergency kit” from your local car parts and accessories store, it is sometimes better and even more affordable, to put one together yourself. Bring your list to LaCava Auto Parts & Supply in Fall River. Our team will help you find everything you need to stay safe on your next road trip or local commute. FIRST AID KIT – You can purchase a pre-packed first aid kit, but just make sure that it includes an assortment of bandages in various sizes, adhesive tape, scissors, gauze pads, rolled gauze, acetaminophen and aspirin, antiseptic wipes, antiseptic ointment and anything else you think you might need. If someone in your family has asthma, you will also want to carry an extra inhaler. If someone in your family has allergies, you may also carry an epi-pen in your first aid kit. FIRE EXTINGUISHER – Make sure that you purchase a fire extinguisher that is rated for class B and class C fires. Class B fires involve flammable and combustible liquids, including diesel fuel, gasoline and kerosene. Class C fires involve electrical equipment, including batteries, panel boxes and switches. WINTER SAFETY TOOLS – Living in the northeast means having access to an ice scraper, shovel, de-icing chemical, kitty litter, rock salt and anything else that you might need to get yourself out of a jam. Extra gloves, extra clothing, warm blankets and hand warmer packs are great to include in with your winter safety tools. 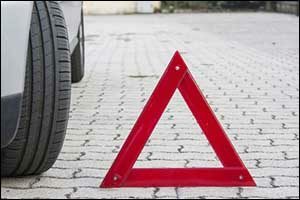 EMERGENCY TRIANGLES – If you break down on the side of the road, it is important to have reflective emergency triangles. Many of the pre-packaged kits come with these, but you can buy them separately at your local auto parts store. Safety studies say that you place them 50-feet apart to warn people as they get closer to your vehicle. JUMPER CABLES – Bare minimum, your cables should be at least ten feet in length and should be safety coated with eight gauge rubber. Make sure that they are new or at least in like-new condition. You don’t want to get stuck with a dead battery and bad jumper cables. Take advantage of free battery testing in Fall River at LaCava Auto Parts & Supply before you head out on a trip. TIRE CHANGING SUPPLIES – You should always have a tire gauge, foam tire sealant, a car jack, gloves and a spare tire that is in good condition. Check to make sure your spare is properly inflated on a regular basis. FLASHLIGHT & EXTRA BATTERIES – Choose a waterproof flashlight that features a bright light and an emergency setting to help get assistance from the side of the road. DRINKING WATER & PROTEIN SNACKS – You never know when you might be stranded for hours at a time until help can arrive. Keep drinking water and protein snacks in your vehicle, but make sure to check the expiration dates regularly. In addition to your emergency kit, make sure to also have a charged cell phone and an extra charger with you at all times. Seasonal gear and a multi-purpose tool, such as a Swiss Army knife, are also good things to have on hand in the event of a breakdown. 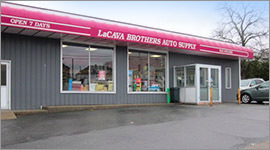 Stop by LaCava Auto Parts & Supply to take a look at our wide range of car parts and accessories. Don’t forget to take advantage of our free battery testing in Fall River when you stop by our auto parts store to get all of your emergency supplies. Give us a call at 508-676-1951 to hear our hours or to ask one of our friendly team members about car parts and accessories for your vehicle. ← Fall River Car Owners: Why Do Batteries Die in the Winter?